somehow, amidst my responsibilities of going to work and attending CLP classes, i have sought refuge and comfort in the act of driving. whether it’s a 5-minute drive to The Sphere to get groceries, or a 40-minute drive stuck in traffic from JHJ to home, driving has been the only time when i am able to be left alone with my thoughts, but not alone enough to be completely idle (because i still have a motor vehicle to pilot), and it’s a blissful respite from the constant thinking i have to do because in that moment and in that moment alone, my sole responsibility was to drive myself from one place to another, while being accompanied by music. which is why the priority for my spotify playlists have shifted from studying playlists to driving playlists, because the absence of music while driving has proven to be an anomalous handicap for me. maybe it’s because it feels too quiet (and thus too alone) if there’s no music on, or maybe i’ve just gotten too used to the habit of perpetually having background music with anything i do or anywhere i go (even more so since the birth of my faithful JBL Go). and thus what transpires are very, very brief moments of incredible clarity of my state of being and my surroundings as i am driving along the highways of KL, with my driving playlist on play like a reliable friend that i can always depend on. notwithstanding the largely relatable lyrics of this song about anxiety, there’s a guitar riff accompanied with repeated echoes of “we’ll be fine” midway through the song that i absolutely cannot resist dancing to, even if it’s in my car and i run the high risk of having another driver look over and pre-judge me to be a really weird city resident among all the other occupants of this city that obey the social cues to remain prim and proper in the eyes of society. as part of one of the mandatory tasks of JHJ’s internship, the other interns and i had to follow the firm’s lawyers to court for one day, and not going to lie, even though i had to leave the house by 7am to avoid the rush hour that could quickly turn my pre-existing 25-minute drive to shah alam into a full hour one, i was pretty excited to be attending actual court for the first time. and thus, 7 in the morning on a tuesday saw me driving to shah alam by myself for the first time, incredibly sleep deprived without a hint of caffeine to help me in my bloodstream, but somehow still functioning on what little adrenaline i could summon so early in the morning and also my driving playlist. my first impression of shah alam was awe at all these official-looking buildings that i’d never seen before, as well as the sultan salahuddin abdul aziz mosque. and it doesn’t stop there. i followed mr hari and amanda into a hearing in chambers for an appeal, and subsequently after that, esther, audrey and i randomly entered courtrooms just to sit in on trials. and listen, i might not be your number #1 candidate when it comes to having a passion for the law, but it certainly was impressive and rather bizarre to witness all the legal theories and procedures i’ve been learning in formal education since four years ago in action right before my eyes, playing a fundamental role in maintaining one of the building blocks of the society. that one day in court together with the lawyers and interns from JHJ really triggered a slight shift in my perception towards a legal career in the future. on the day of Undercurrent at The Bee, Publika, i had a sudden client meeting to follow kamlesh to at UOA Business Park right after work that morning, so my plan to go home first before picking hui wen up to go to Publika got scrapped, and i found myself smack right in the middle of rush hour traffic to get from glenmarie to puchong, and then to sri hartamas. to spice things up even more, i was only left with a single bar on my fuel tank, so i had to do a detour somewhere in subang, immersing myself further into the jam. 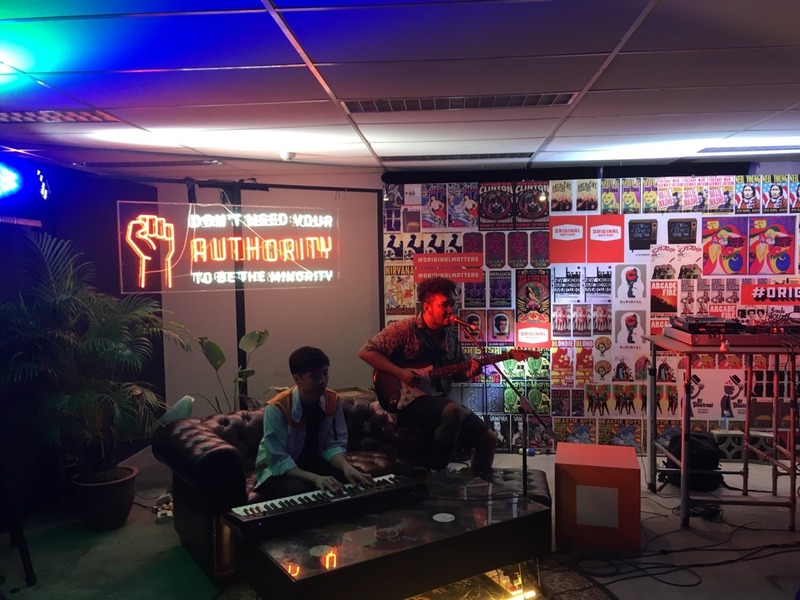 we reached Publika pretty early though, and had the bombest calamari pizza with beers while discovering new local music live. there was a period of one week after my sudden panic attack when i completely restricted myself from any and all activities that did not involve studying at home the whole day. it was my way of coping with the sudden surge of fear, until a few days later during lunch when i watched the latest kaguya-sama episode which involved an extremely detailed commentary about ramen, and i made up my mind on the spot that i was going to have ramen for dinner that night. but that brief outing pulled me out of my fear haze long enough for me to look at the world through clearer lens again, to realise that a lot of obstacles and hindrances in life are self-constructed, and that there is nothing wrong with loosening the self-inflicted pressure noose you have had around your neck all this while. rumin, lionel, marco and i went to ipoh for two days to celebrate lionel’s birthday, and i didn’t drive at all, but it was still a place that i’d gone to. it was my third time being on an official trip to ipoh, and the second time with rumin. we revisited all the places we’d been to (because ipoh really isn’t that big), had food coma after food coma, and then burned under the 37ºC heat even as we drove from one place to another. Best Friend was my most listened to song for that month, and it was a pleasant surprise to me to find it playing on marco’s playlist as he was driving us to ipoh. boy pablo is one of those artists whose music i really liked even upon first listen, and Flowers is one of those songs that made me really sad even upon first listen. after my panic attack last week, i was recommended to attend a counselling session at the said recommender’s church. i didn’t really know what to expect out of the session, never really having told anyone besides family and friends about my anxiety. i didn’t know what to expect, but it definitely wasn’t an influx of reassurances that i have been doing the right things all this while. i wasn’t told anything that i didn’t already know, and the counsellors similarly acknowledged that, but, and i only realised this during the rainy drive back home, i was filled with a deep sense of serenity and relief that came with firm reassurances like these. all this while, since i was 17, i never really knew what i was doing, especially in regards to my mental health. sure, i talked to my family and friends whenever things felt too overwhelming, consulted friends who also had a history of anxiety, and read a bunch of twitter threads and one too many thought catalog articles for my liking, but these were all self-regulated without any external force to validate my own actions and coping mechanisms. 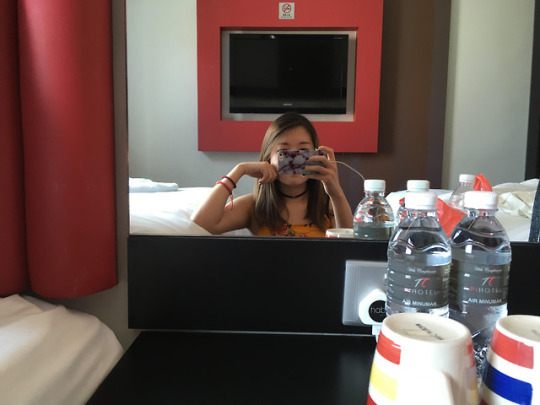 all this time, i have just been trying to get by without allowing my anxiety to stop me from doing the things that i wanted to do in life, like attending college at sunway, flying to a foreign country alone to study in uni for three years, and living alone in the capital city while juggling both studies and an internship at the same time. and at the end of the day, they really were just words uttered by strangers that i’d met for the first time, but it still brought upon myself a strong sense of triumph and satisfaction that my life is still mine to make of it, and that i have been, and am still capable of continuing that. last tuesday was (technically) my last day of my internship at JHJ. we had a mooting session in the morning about defamation, and after that, it signalled the end of the last module of the internship, and there was a mini party at night with kamlesh and the other lawyers. honestly, applying to JHJ didn’t even feel all that long ago. it feels like it could just be last week when i was consistently feeling restless being by myself at home, still trying to adapt with this newfound and rather permanent solitude, and being in a huge city with so many responsibilities to fulfil. it feels like it could just be last week when i went to JHJ for the first time and was interviewed by kamlesh and chin han, and it also feels like it could just be last week when i first met esther, audrey, may, divviah and di shen while being briefed about our modules and contracts. and now the melancholy is starting to set in as the empty spaces on my task checklist are gradually filled with signatures, and i realise that our days of being able to use the war room are numbered. every single person that i have encountered during this internship journey has been nothing but kind and helpful, even when they were so busy and deep in work. despite being absolutely clueless about so many of our modules and tasks, everyone has been so patient and willing to teach us bunch of oblivious interns about mock tasks that do not even benefit them directly. and for that i am so incredibly grateful. if there’s anything that has improved my perspective towards practising law as a whole, it’s these people at i’ve met at JHJ. this is just a post for the sake of writing in february. it’s been a month of drafting agreements, meeting family and friends for the new year, eating less rice, and driving while listening to rex orange county at hours on end. things could be better, but it could also be worse. this year was the one year where it felt like a combination of several years. half of it was spent in manchester and the other half in KL, and already i feel like the person that i was during these two periods was two completely different people. i’ve already talked about manchester so much on here, but 2018 in uni, even more so than the second half of last year, was one of the best periods of my life that i’ve ever lived through. it was a year of many new friendships…and also heartbreaks, and most importantly feeling utmost satisfaction and confidence in my own skin. and then came graduation, objectively supposed to be one of the most important milestones in my life. after which came the onerous ritual of adulthood that involved moving to a brand new city to live alone and feeling like i have to work from ground zero again. and it was difficult, and it is still difficult, but last week, a day after the pool party, as i was in the grab on the way to KL sentral to take a train back home for the christmas break, i realised that i was heading home with a slightly heavier heart than previously. i realised that i had started to form pleasant and comfortable memories of living in KL, like eating pork noodles with new friends, getting late night soft serve with older ones, and even hanging out on discord with people i’ve never met talking about a mobile game. 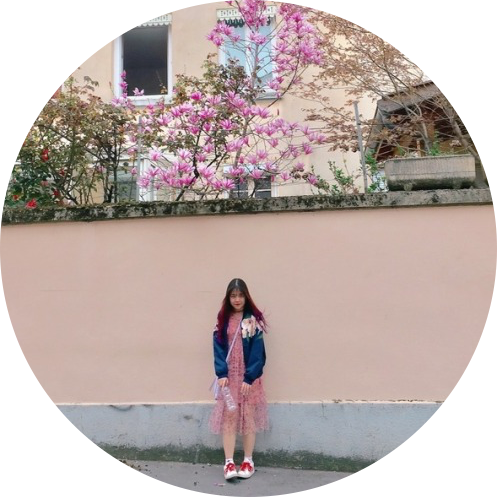 they weren’t much (especially if i were to compare them to uni days in manchester), but they offered solace in the fact that i was capable of creating happy memories and feeling comfortable in a place that felt hostile to me upon my initial arrival. 2018 has truly been a year of many changes, some upsetting, but most were welcomed changes. i can only wish the next year to be as great if not greater than this year, to help me grow and learn towards becoming the person that i want to be. do you ever just one-up your own sadness? think to yourself, i have never felt this sad before, and then a week later you think the same thing, and then the week after, and then after. i was upset when i got here, so i made myself go out everyday, texted friends to hang out with almost every hour. i told myself that it’s fine now, i still have many friends here. then i felt too restless, so i took japanese classes and got a job, and i told myself it’s fine now, i will be too busy to feel sad. and then now i realise that in the midst of busyness i still feel empty. without the distractions of multiple real life responsibilities and people and games that are to be honest sustaining me when i’m home alone, i don’t know how to feel happy. i thought i was doing well but perhaps i’m not. and i feel scared. i feel desperate. i feel lonely. i don’t like thinking there is an external solution to this that i need to find, because ultimately self-care comes from within, but i don’t know what to do to make myself feel happy anymore. 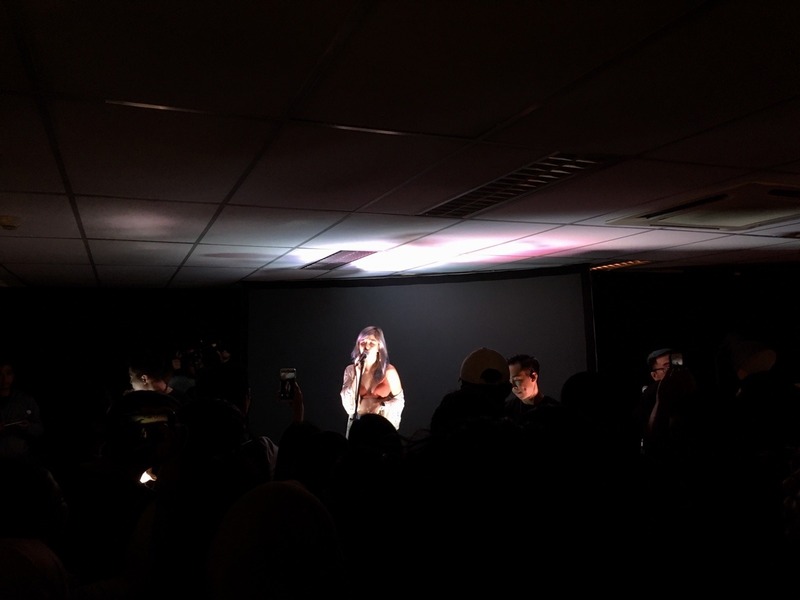 in my pursuit of KL’s artsy fartsy art scene, i said “yes” in a heartbeat when taliza invited me to join her friends to catch lost spaces and talitha’s gigs at urbanscapes house. also they have really aesthetically pleasing single covers and i am weak for pastel colours of the pink to purple range. after the party, taliza and i headed for the balcony of the third floor of 2 Hang Kasturi for an impromptu shoot, something that i hadn’t done in nearly four years. and it felt really nice. there were other people around too, so there was no helping the initial awkwardness of people staring and a four-year hiatus (and an oily complexion after having just emerged from a crowded room), but it felt familiar, and it was taliza, and it was one of the few moments so far during which i felt the complete compatibility of my surroundings, and being in the city of KL.